THE country’s semi-professional soccer competition, the National Soccer League (NSL) will kick off this weekend in Madang and Port Moresby. The official launch of the NSL Cup was held last night at Port Moresby’s Holiday Inn with major sponsors and PNG Football Association executives ushering in soccer’s new prize, the Telikom NSL Cup. 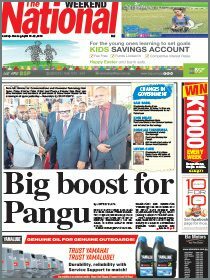 Telikom PNG announced a massive K400,000 sponsorship to support the competition in the new season. Telikom CEO Peter Loko said the communication company would provide K200,000 in cash and another K200,000 in kind to get the NSL to drive the development of the sport. “I am not ashamed to say that Telikom has invested a lot of money into sports because it helps develop people,” he said. Loko called on all soccer fans in the country to saying no to the violence in sport. He asked the administrators of the game to stamp out violence. He commended soccer especially the National Soccer League because there had been no report of violence in the semi-professional competition. “The NSL continues to set the example in professionalism and sportsmanship in sport in the country,” he said. He commended the chairman of NSL Mr John Kapi for taking a bold and brave stand to head the competition. Kapi Natto thanked Telikom PNG and all support sponsors. He also thanked all nine franchise owners for supporting the teams for this season. 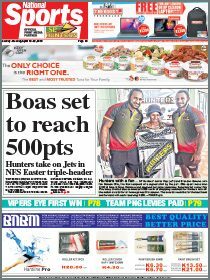 The teams are Hekari United, CMSS Tigers, University Inter, Gelle Hills, Eastern Star (Port Moresby), Niu Petro Fox (Madang) University Lae, Gigira Laitepo Morobe and Besta United (Lae) In Madang, new-look Niupetro Fox will take on the Wesley Waiwai-coached Gelle Hills which should be an interesting match. The acquisition of Solomon Islander David Taro will no doubt strengthen the backline for the Hills as the regather their momentum after a one year absence from the league. Apart from Taro, Hills has retained the services of former players Leana Geno, sneaky David Kila and Tau Matagolo who should boost the team with their experience. While Niupetro Fox of Madang are the unknown and untested pack. In Port Moresby, Eastern Stars will be boosted with the signing of two Solomon Islands players Timothy Joe and Paul Walei in the midfield and on the wing when they take on University. Former University Andrew Marampau has jumped ship and will be up against his former team University Inter FC. University has a vast pool of talent to select from which include former CMSS Tigers Richard Auram, Armstrong Peka, Tarcicius Gringo and Neil Hanz. Striker Tau Winnie is subject of a transfer controversy after he signed with Gelle Hills. CMSS Tigers have recruited well with Ian Yanum, Beckham Yanum, Gari Moka and Nathan Vincent while University Lae provides another untried presence to the mix. The main match between Gigira Laitepo Morobe FC and Hekari United should be very competitive as both teams have retained the core of their squads. Team Manager Stanley Khana said the Apo brothers from Welgris Highlanders have joined the team for this season. Skipper Mathew Yang will lead the boys in this year’s NSL campaign. Hekari United has retained all its players except for Samuel Kini, Pita Bolaitoga and Tuimaci Manuca. Despite the departure of Abraham Iniga, Jacob Pekau and Jack Samani to Solomon Islands, Hekari recruited well during off season in preparation for O-League and the NSL competition.